McKenzie River Scavenger Hunt: Find Chucky and Win a Prize! A couple of weeks back, I was guiding a single angler on a section of the lower McKenzie that I hadn’t run since the previous high water event. The day before had been relatively slow: the river had been high and rising and the weather had been miserable, but by the following morning things were looking up. The day was warm, the sun came out, the river was quite high but dropping and a nice color. The fishing wasn’t outstanding early on, but in the first few spots, we managed to get a couple of respectable rainbows. Little did I know what lay in wait just around the corner. I came around a small island, through some fast water and dropped into the top of the next pool. We started to nymph the inside edge of the current, starting in the faster water at the top and getting some long drifts down into the pool below. As we fished the pool, the bobber went down on several occasions and a my guest brought a couple of nice, medium-sized rainbows to the boat. Normally this would lift my spirits, but something just didn’t feel right. The sun was shining. The fish were biting, but the little hairs on the back of my neck were standing up. We were being watched. Quickly, I scanned both banks and didn’t notice anything. We drifted down through the pool, focused on the drift. As we prepared to move downstream to the next spot, I glanced over my shoulder and there it was. At first I wasn’t sure if I should try to document my find or just get out of there as quickly as I could. Its gaze was fixed on us. Chucky’s stance was a little askew, but he stared directly out at the pool, watching us as we fished. 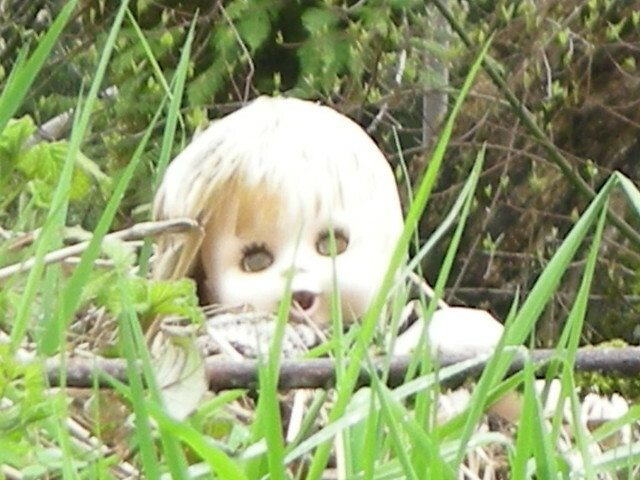 Hands down, this was the spookiest piece of flood debris I had ever encountered on any river. Ever. Yesterday my friend Kyle and I were faced with a dilemma: we wanted to fish the stretch of the lower river that would bring us past Chucky’s lair. We liked our chances for the fishing. The river was in great shape, and cloudy skies held the prospect for a good march brown hatch, but as we approached the ramp, all I could think about was that awful little doll. My apprehension was not entirely unwarranted. As a much younger person I had watched Child’s Play, Child’s Play 2, and Child’s Play 3. For those of you who haven’t seen these classics, I will save you the time. The take home message is: demonically possessed dolls are not to be messed with. Later, the films Bride of Chucky and Seed of Chucky emphasized the homicidal zeal of not only Chucky, but also of any other evil doll that might be related to him by either blood or marriage. With these ideas swirling around in my head, we left the ramp. Were we tempting fate? Only time would tell. The fish gods smiled on us. 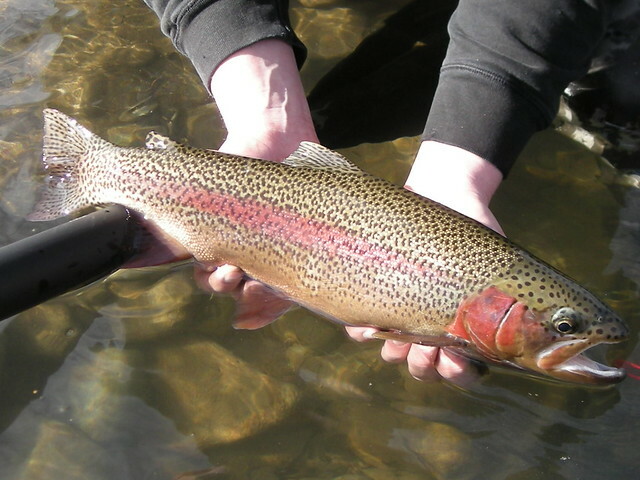 In the first hole, Kyle hooked and landed a big, dark, male rainbow that looked like he had just finished spawning. Later, we passed Chucky’s hole without incident, and we were rewarded with good fishing throughout the afternoon. Later, we found a kingfisher that had mistaken a rooster tail dangling from an alder branch for some sort of flying fish. Kyle cut him down from the branch, removed the treble hook from the back of his head, and sent him on his way. I was worried the bird would be exhausted, but he flew off, seemingly unscathed. Chucky had spared us from his wrath, and we managed to enhance our river karma by saving the kingfisher. 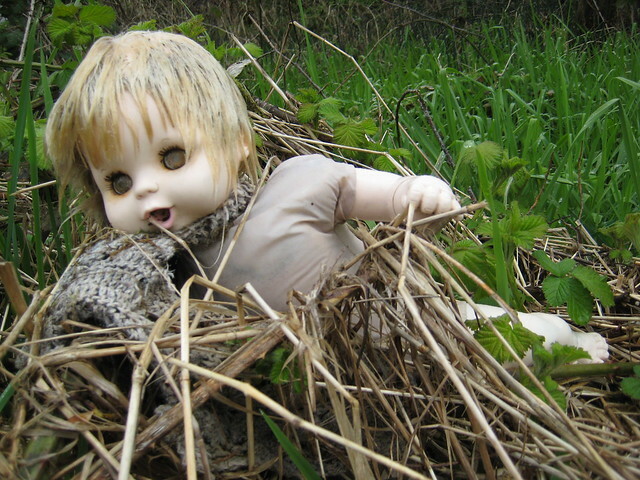 Maybe the doll was not as malevolent as I had feared. 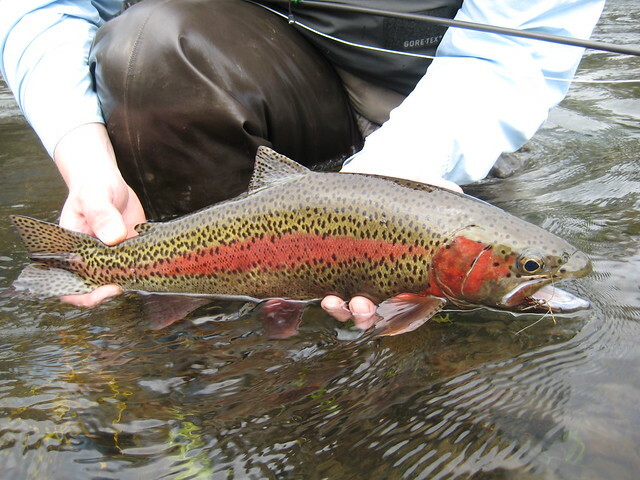 This entry was posted in Fishing Reports, Fly Fishing Contests, McKenzie River. Bookmark the permalink. 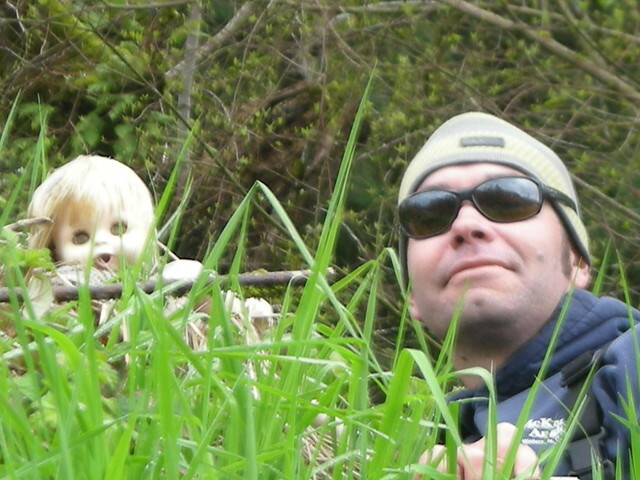 11 Responses to McKenzie River Scavenger Hunt: Find Chucky and Win a Prize! i love a good treasure hunt! I have also been looking forward to a section of the lower mac. Im waiting for a full moon so I have a better chance of finding chucky tho. Thanks for the report and nice fish. Double bonus points for helping the Kingfisher! Liked the last pic..there is at least one twisted creepy little guy in that shot! A few years ago as I was cruising the Willamette below the confluence I spotted dirty blond hair and what looked to be remains of a body caught up in some drift wood and brush. I circled back and after a closer look I discovered it was also a doll, not Chucky, but an inflatable version, more life size. That’s awesome! What a creepy find. Well written. The lesson here is don’t watch that type of movie and don’t let your kids watch them either. Any day one can assist a Kingfisher in distress is a great day indeed. The title Seed of Chucky implies that demon dolls can, in fact, reproduce, but I am not sure by what means. I think in this case it would be “Spawn of Chucky”. PS. Not that I ever noticed, but Barbie does have a nice rack…just sayin’.